the bottom of this post. Still TL;DR? Use it in rails console? see ripl. That's where I started playing around with ripl. need the power of erubis over erb. against it, too. Just like a text editor. Personal taste only..
easier to extend and customize, and this is also a fact. applications, which always try to provide the best defaults. some plugins would work with other plugins. (e.g. Enough of rubbish, let's see the comparison. 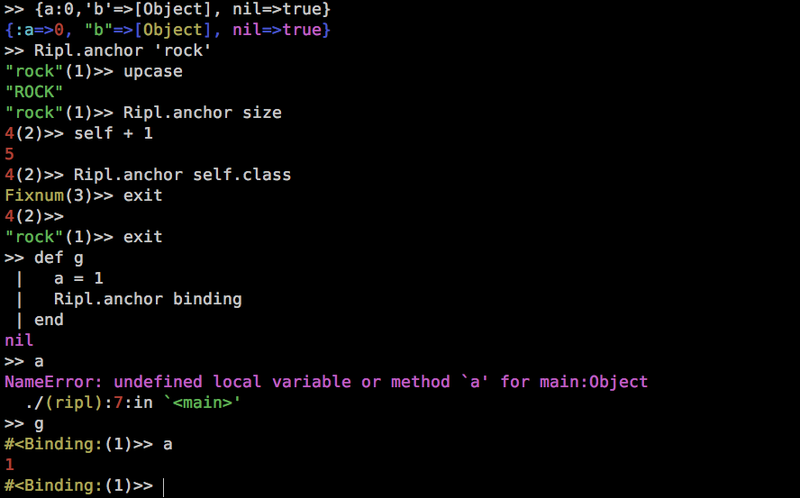 ruby 1.9.2 has no this problem in irb, but 1.8 and ripl do. instead of messing up with shell prompt. very verbose. This ripl plugin strips those backtrace. objects, instead of inspecting it and parsing it. to pick up which color should be used upon a ruby object. is empty just like irb. I think implement pry like feature in ripl is a lot easier. No need to be fancy, I just need the basic functionality. interested in ripl-rails and ripl-hijack, too. and `ripl rc rails` shell commands did.